Sandvine's Better Broadband Blog analyzed Internet traffic yesterday and found that at one North American fixed access operator, Apple's iOS 7 release accounted for 20% of total network traffic. Upon release at 1PM ET, Apple Updates immediately became almost 20% of total network traffic, and continued to stay above 15% of total traffic into the evening peak hours. 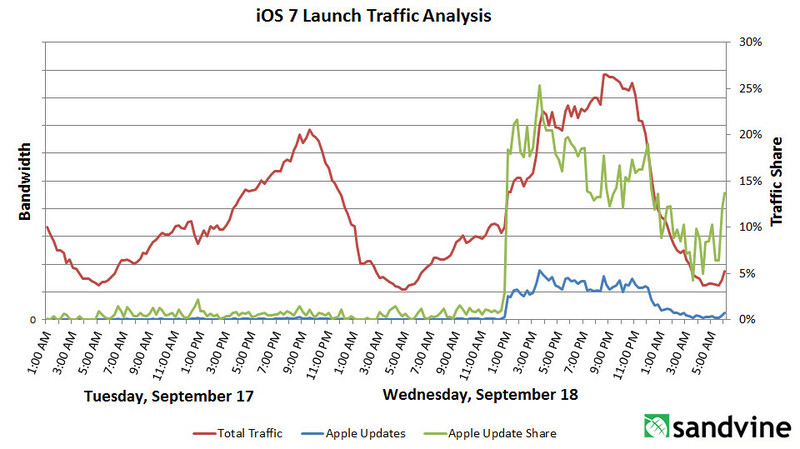 What I found most interesting is that the launch noticeably increased the total volume of traffic during peak hours. This presents a unique challenge for operators, since they must engineer their networks for peak demand, and Apple product launches and software updates are infrequent in nature. Take a look at the chart below to see how traffic levels spiked. An early estimate has 30% of Apple customers already updated to iOS 7.